Taffy makes sure I get out early. 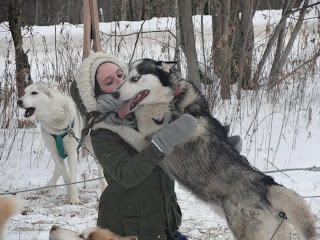 Was there ever a more enthusiastic dog? Here we are, me bundled in scarf and hat because before the sun gained a toe-hold, it was a chilly temperature for sure! Almost 20 below! That didn't even slow Taffy down. This is the trail coming back from the hangar towards Sunflower cottage. Sam tells us that this unicycle, with its very wide 'mountain bike' tire, is intended to use for trick riding. We think the biggest trick of all is being able to stay on it! We were impressed! It did give Sam an edge when it came to the Snowball Fight -- and his cousins were good about handing snowballs to him as he cycled past to keep him well armed. 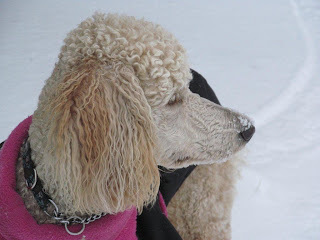 There was a lot going on in the Parking lot -- from sliding down the drive itself, or the big snowbank, to snowball fights, and playing with Taffy. 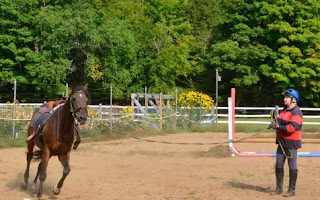 Adding Sam's riding to the mix certainly helped raise the bar! Watch him in action! We are very lucky to have not just one fabulous Provincial Park on our doorstep, but two. 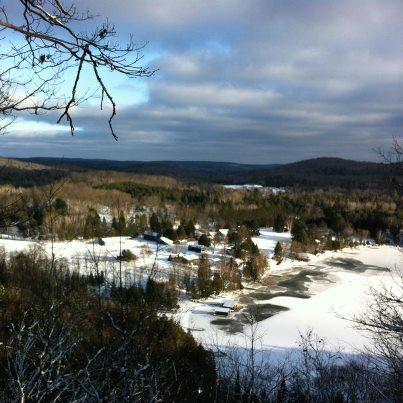 Come winter, Arrowhead Park comes into its own -- it boasts one of the best nordic ski networks anywhere in the Province, and is host to all kinds and levels of competition throughout the season. It also runs a great Learn to Ski program through their Jack Rabbit system. 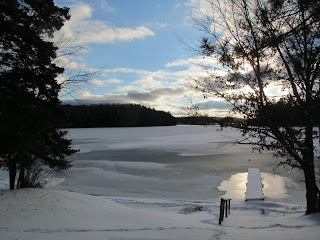 If you are a skate-skier, or a more classic nordic enthusiast, there are trails here for you that are really fabulous. But it is never content to rest on its skiing laurels, and last winter Arrowhead opened its Skating Trail. Yes, it is a trail, yes it does wind through the woods, yes it is different, and totally fun! Nadine and little Zoe tried it out this week, along with the rest of the family, and it rated several thumbs up. 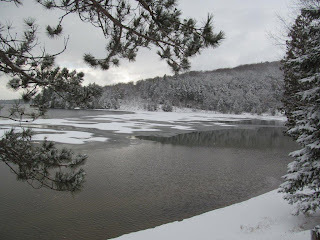 Hiking trails abound here as well -- which in winter become ski and snowshoe passages. Stubbs Falls is a particularly picturesque trail. 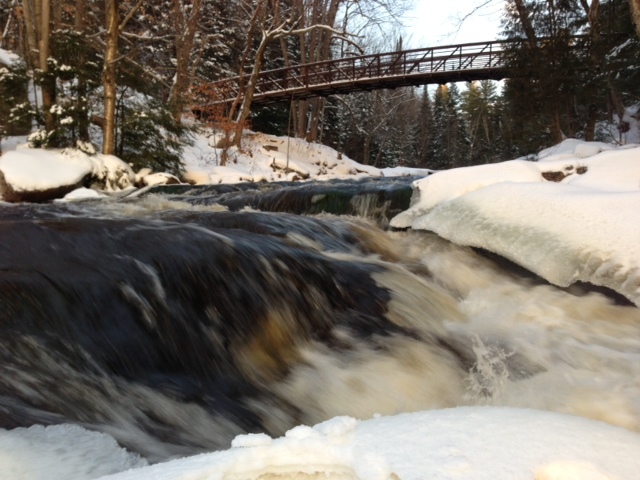 The Falls and the river provide plenty of opportunites to get the cameras out. Come the end of the day, our guests were happy to come home to Bondi, to a warm fire, and a fantastic view across our Bay, watching the sun set. This time of year the colours across the ice are pretty darn impressive. Thank you Nadine, for sharing some of your vacation pictures with us! When our guests take photos as wonderful as these, I wonder why I even bother to get my camera out of my pocket! It's frozen... officially. Not quite skate-worthy, but it is coming. 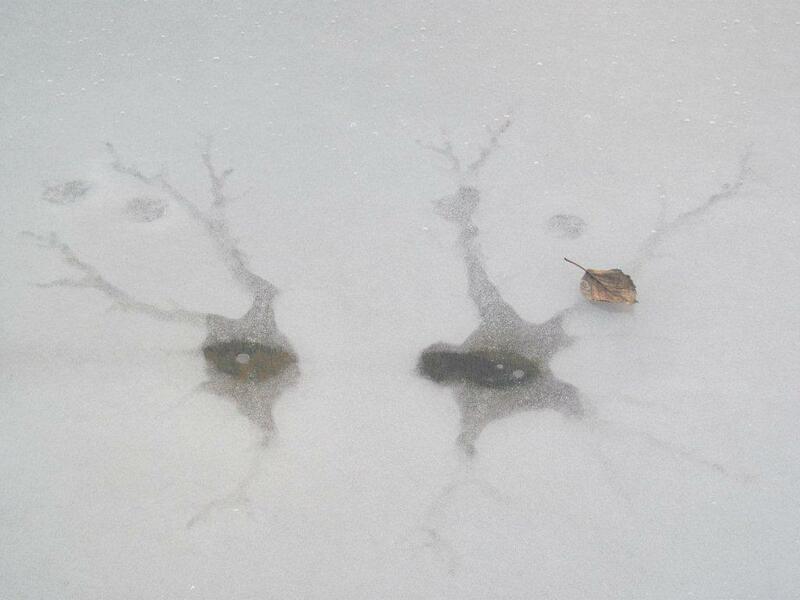 Just admire the curious patterns of snow and ice that accompany the freeze up. 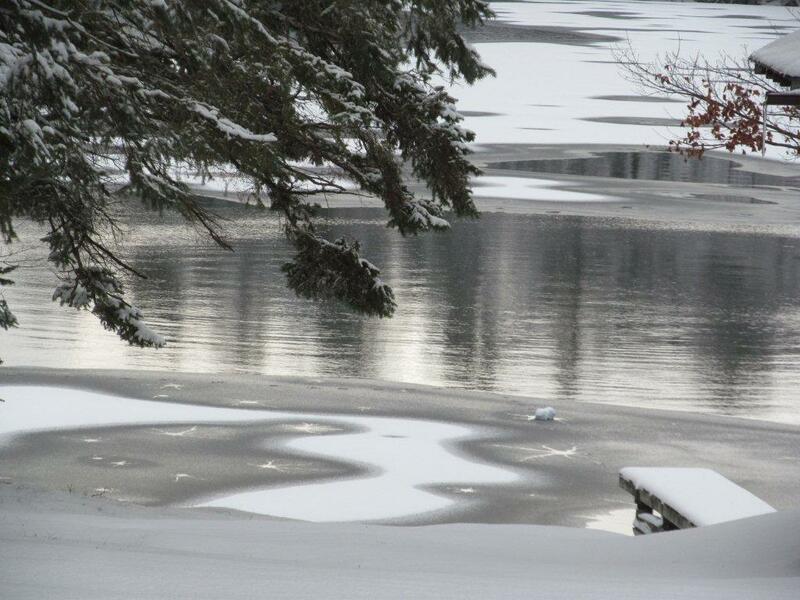 Thank you to our guests Yaara and Uri for sharing this picture with us, taken on Christmas Day. Uri and Yaara were here for several days over Christmas, with their family and friends -- some visiting from Israel! They were looking for Canadian Winter, and they sure found it! 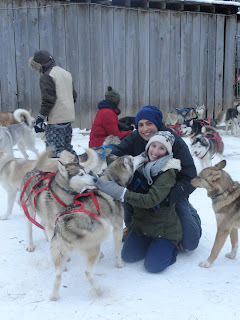 Yaara sent us these photos, taken on Boxing Day, of the family enjoying time at the Haliburton Forest Reserve, visiting the Wolf Centre and going out with the Sled Dogs. Dogs running are fast. Until you've been clinging on to the back of the sled, you don't really realize just how fast they can travel. 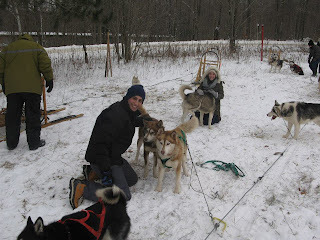 And while there is usually a lot of singing and howling going on before the start, once the dogs start to run, they are pretty quiet... which gives an unparalleled opportunity to really come to grips with the winter woods. Their very happy faces -- both people and husky -- tell the story. 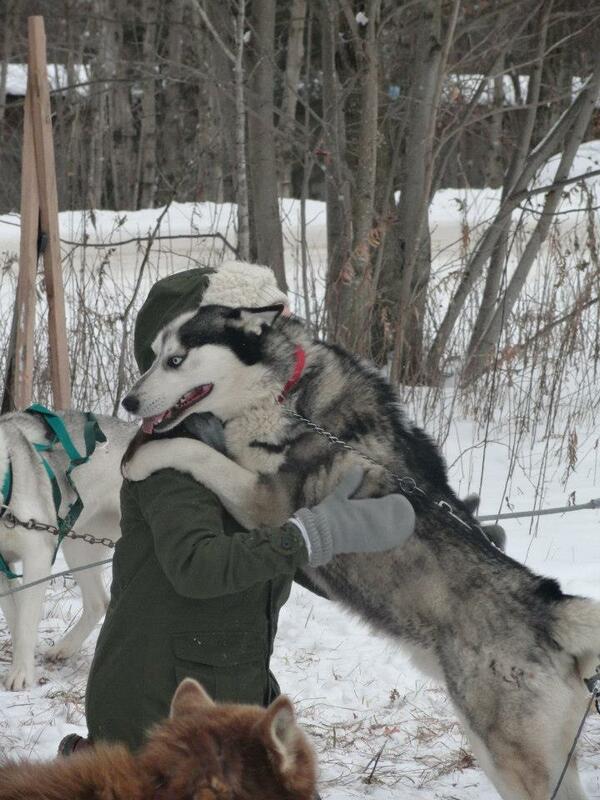 And the dogs were very willing to return the thank-you hugs. Sled dogs helped to open up northern Canada. 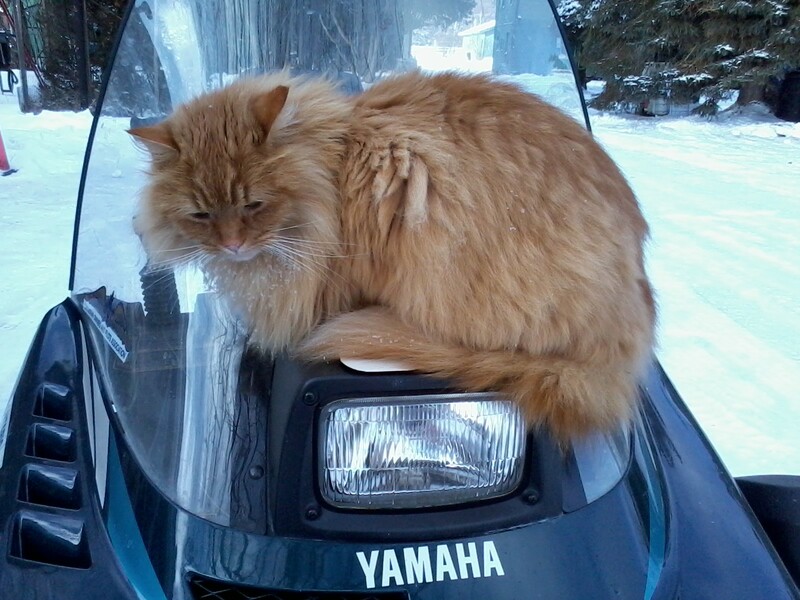 In many places they are still the mode of transportation, and are often more reliable than a snowmobile. 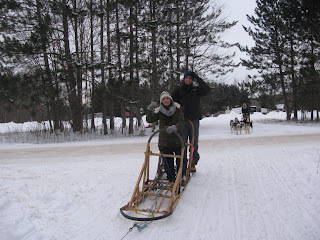 During the winter months, there are several Sled Dog Derbies that run in the region, where you can watch them racing. And there are several providers that will take you out for a day like this. 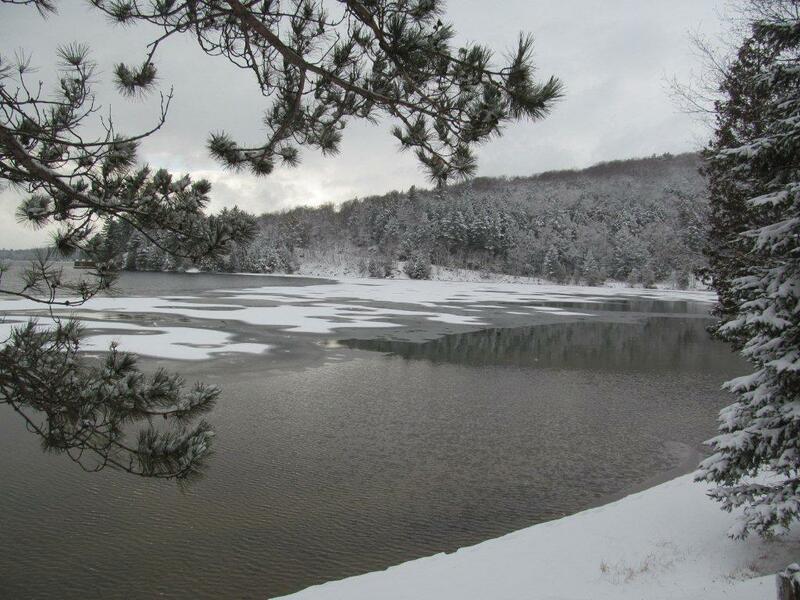 Or overnight ... or even an extended trip of several days for those who want to try winter camping. If the nights get too cold, you can always toss another husky on top of the sleeping bag ! 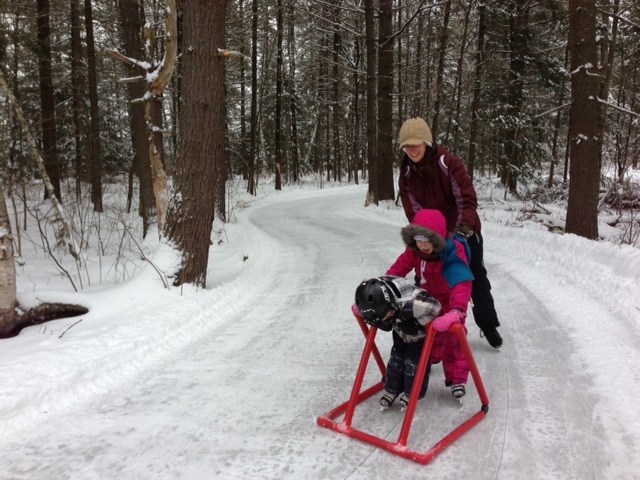 The Haliburton Forest Reserve does more than offer great sled rides in winter. They are also home to the Haliburton Wolf Centre, a fifteen acre compound tht houses a pack of wild timber wolves. The Centre features a movie theatre, museum and gift shop. More importantly, it boasts a fantastic viewing area, with one-way glass and full sound-proofing, where visitors can watch the wolves, without the wolves being disturbed. 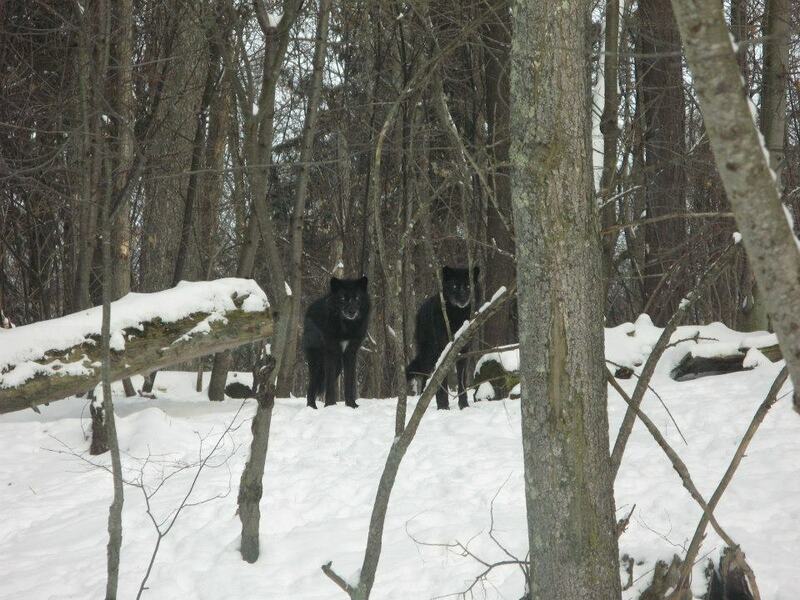 This last picture shows two of the Centre wolves, looking back at the Visitor Centre. Not perhaps as sociable and friendly as their long-descended husky cousins, but very much part of our Canadian wilderness heritage. We are fortunate at Bondi Village that we have fantastic places like this within an hour's drive that can provide such incredible experiences for our guests. We know that this family will never forget their Canadian winter sled ride! Labels: Bondi Village Resort. Haliburton Wolf Centre. 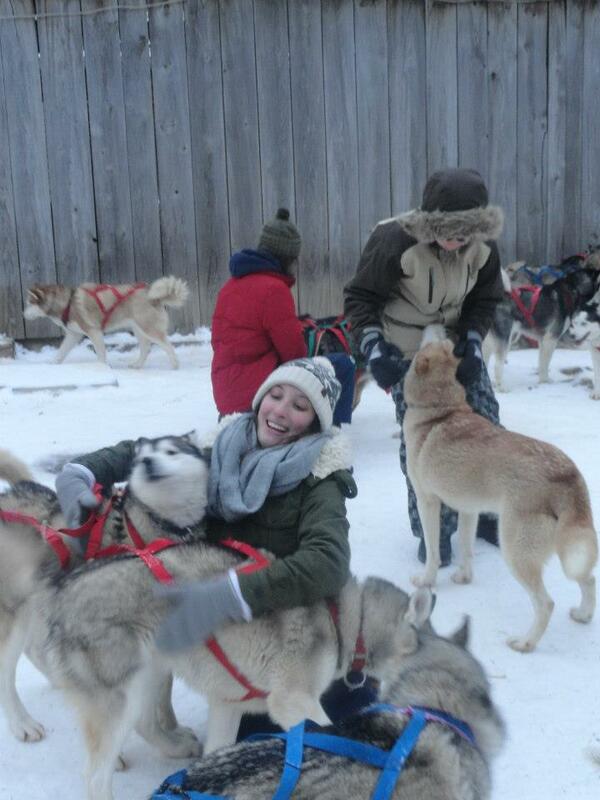 Dog Sledding in Muskoka. Wolves. 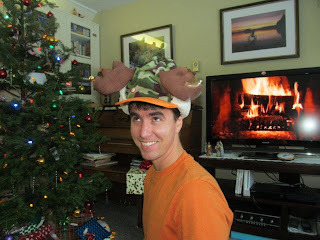 Everyone has their own traditions at Christmas. One of ours is to go for a hike after lunch. Brian and David always climb the mountain. You can't beat the view from the top! I didn't join them this go round, because I had a group of guests with me from the Resort, and two of them requsted something shall we say, less hilly. 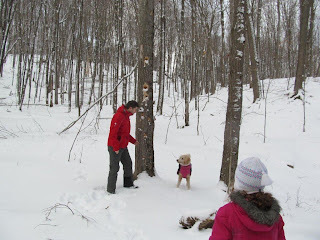 So we tramped out through the sugarbush. We found all sorts of cool things, as one does, whenever one gets out into Nature. 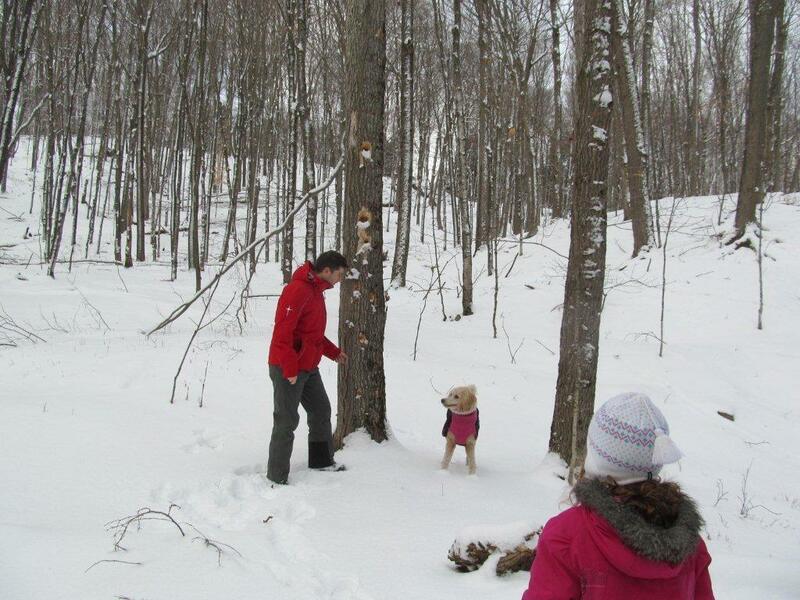 Taffy was happy to be tour guide, pointing out the tree that the hairy woodpecker had been carving up. We found trees where deer had polished up their antlers. Lots of woodpecker work. Lots and lots of tracks -- rabbit, squirrel, deer, fox... A tree the bear had broken down at the top to reach the apples... there is always lots to discover. And no sooner where we back at the Resort office, waving and shouting up to Brian and Dave on the mountain top, than David phoned me. "Eagle alert," he said. "He's circling just to the left of you, over Longside cottage." And so he most beautifully was. This time several of our guests also had the chance to see him. Bondi Bay has now frozen all the way across. That is not water now gleaming around Clover's dock, but clear, hard ice. Almost enough, but not quite... Keep fingers crossed, we could be skating on our bay very very soon! There were lots of visitors at the stable today too, to meet the horses and collect eggs from the hens. 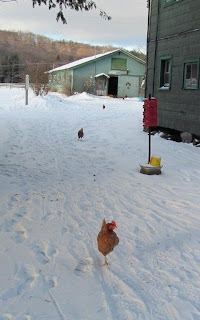 And speaking of the hens, it was a mild day today, so out they ventured -- in fact, we got a picture that proves that sometimes, just sometimes, we can get all our hens in a row. Our day is bracketed with a family breakfast -- again thanks to the hens for providing the eggs, and to David and Nancy who prepare the meal. Dinner is down to Carol, and there is nobody better at preparing a feast. We hope that your day was as lovely as ours, with your own traditions. It is Christmas. The time of year we pause to catch our breath before diving into the New Year, and to touch base with friends both near and far. I am writing this on December 12. 12/12/12 – that’s a confluence of dates we won’t see again. 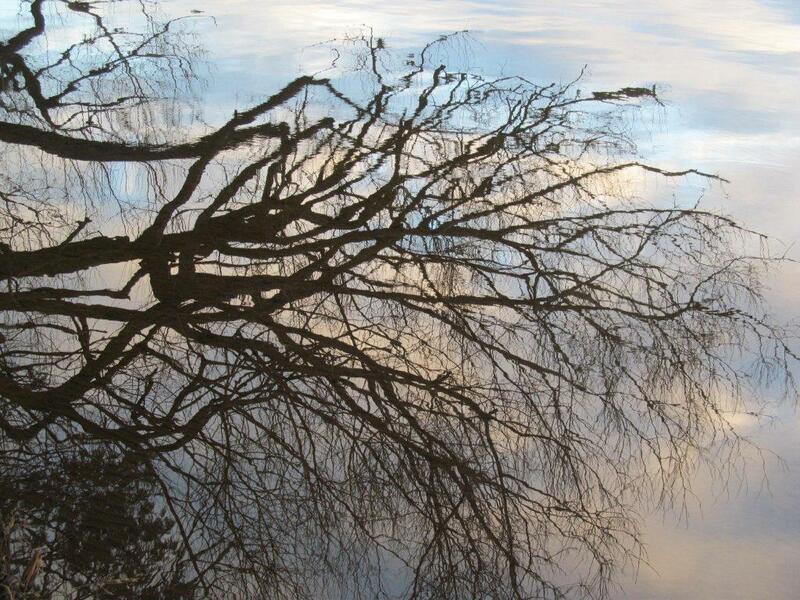 The Winter Solstice is drawing closer. It will bring with it the longest night, not to mention the Mayan End of Calendar, and then will herald the welcome return of longer days. It is a reminder that light is stronger than any dark, every night has a dawn, every winter has a spring. That’s a message we can all take to heart, at this time of year when we celebrate the greatest Light of all. “Be not afraid,” said the angels, “for we bring tidings of great joy.” So in this darkest time of year, we are reminded that Christ is the Light of the World, who came to us with ‘tidings of the greatest joy’. It is a time of year when as we crawl through malls in search of material things, we might be better to pause and ponder the real meaning of Christmas, and ask, if that’s the line to see Santa, then where is the line to see Jesus? 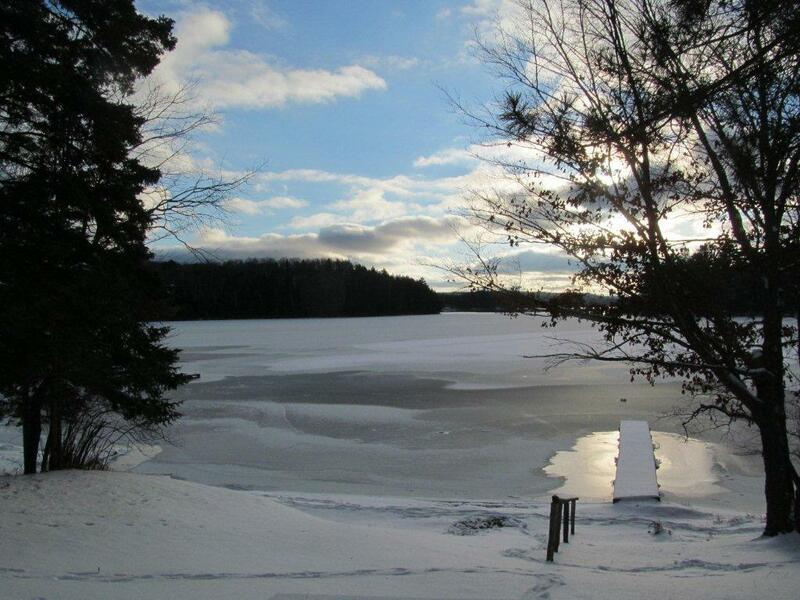 2012 brought us a winter with plenty of snow, but since that seemed not to be the case much south of Gravenhurst, a lot of folk didn’t seem to realize it was winter. Up here conditions were great for ski and snowmobile sports, despite a warm spell in January. 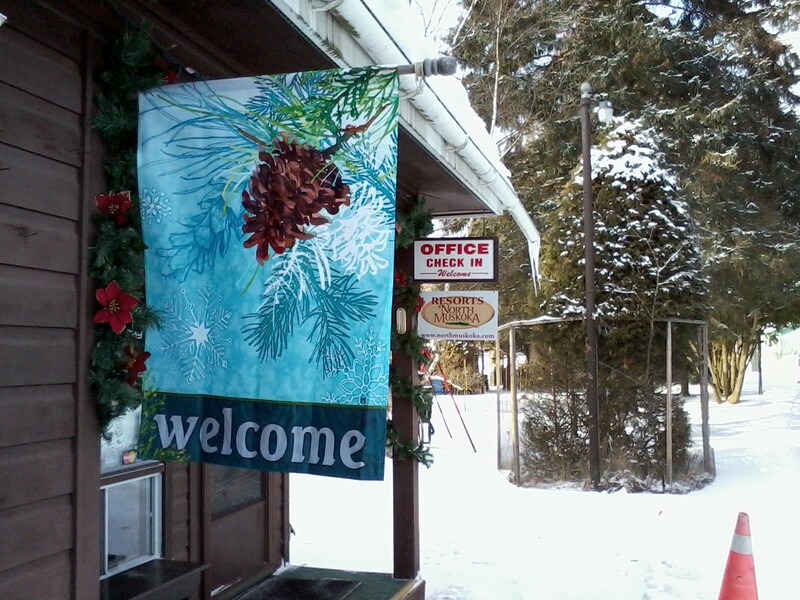 We welcomed back our skiers, snowmobilers and snowshoers. 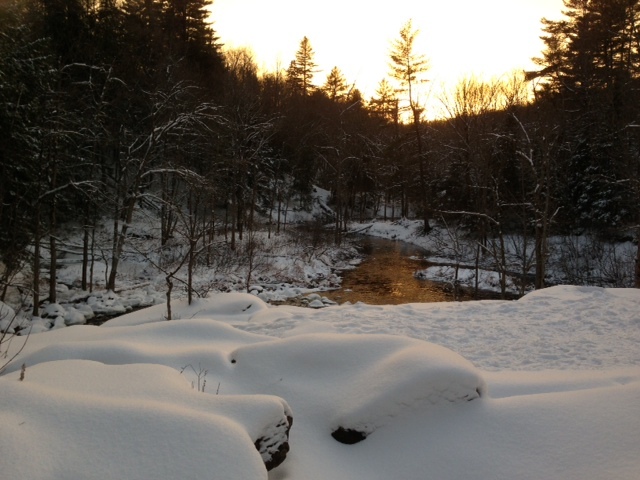 Brian and David had the ski trails in superb shape. Something new, we hosted a Paintball Biathlon, combining skiing with target shooting with paintballs! 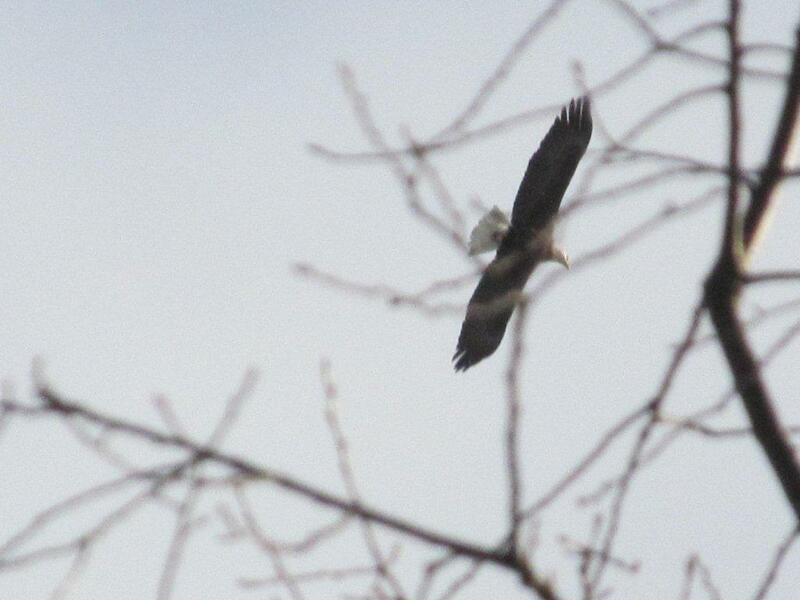 Guest sightings of Snowy Owls and Bald Eagles made sure we all kept our eyes open, too. Spring came early – the ice went out March 25. Our average ice-out is April 23, and in over 100 years it has only happened in March three times – 1940, 2010 and 2012. Hello Global Warming. Seasons occasionally seemed confused. March and April sort of switched places -- enough to trick the gardens. A lot of crops suffered from the switched about weather. for Zip Lining in Mexico. In March, Carol, Dave, Brian and Mike joined Carol’s daughter Rebecca for her 40th birthday cruise to Mexico. Yep, they actually went on one of those floating cities. Unlike the Costa Concordia, their boat stayed nicely afloat, and full marks go to Norwegian Cruise lines. Dave and Mike, however, did discover the perils of falling asleep on a deckchair in the Caribbean sun. Carol enjoyed catching up with her family, some of whom she hasn’t seen in years, and reminiscing about their childhood in Brazil. Carol signed up for Fencing Classes this spring, taking Mike and Dave along. Dave thought it involved barbed-wire, and while they had a lot of fun, they found it tougher than they thought, and are not quite Olympics ready. Sometime in mid-June it stopped raining and didn’t start again until into late August. New water toys were popular - the lake was the place to be. The Fire Ban that came with the extended drought put a small crimp into the making of ‘smores at the Cookouts and saw a lot of irrigation pouring into Carol’s lovely garden. Even so, crops suffered.. The corn ripened all at once it seemed, keeping us busy picking and eating and freezing! Mike Bechtel joined us again, his 5th year working with us. He keeps Dave on his toes. And Dave repays the favour. The pair of them keep the rest of us sharp. He’s a member of the family now! We were also joined by Natalie this summer. Come August, Dave has been out of college for a year, and is enjoying working at the Resort full time. He was happy to be home for the summer to reconnect with friends at the Resort. He’s wonderful with our guests, if we do say so ourselves, and takes guests waterskiing, for paintball experiences, manhunt and general activities. Carol is especially grateful to have him here, finished with academics, and seeing his smiling face every morning. His positive outlook is a joy. A trip to Niagara Falls and whitewater rafting the Ottawa were also on his activities list this year. And yes, he is still with long time girlfriend Megan. He put his skills to use building a fish hut and a ‘Hunt Camp’ on one of the tiny lakes on our land. It seemed timely. He and Mike took the gun course and hunting exams this year and went deer hunting with our long time guest Herman come autumn. With his guidance, they learned a lot about hunting, not the least of which including carrying the 9-point buck out of the bush. They also learned about how to cook what they caught, not just fish, and grouse, but venison. Brian added a second solar installation last year, so now we have two, plus a third that heats water. Both work well, and add about 24,000 kwh per year of green energy to the grid. Brian thought about adding another, but “when the weight of the paperwork equals the weight of the project, the job is done.” Until the Government gets serious about encouraging these, it’s not feasible to expand. This autumn, with great sadness, we said farewell to Walter Hadden, who left us in his 89th year. Along with his wife, Evelyn, Walter has been a cornerstone of our summer, with their combined families visiting us for 51 years in an unbroken chain. The whole premise of our resort is to see so many familiar faces and families return, providing a place to build their best memories. Walter and his family have been a big part of that. Every year we update and upgrade. Usually it’s stuff you see – renos, floors, beds, curtains... The big rebuild project for the resort this year has been one you won’t see. It’s not glamorous, and in fact, not visible. The MOE has updated its requirements, regardless of how the current systems function, resulting in our re-doing many of our septic systems and although it was not in our build plans for this year, in order to comply, here we go. We will be the most up-to-date resort in the area when we are done! November saw Brian, Carol and Dave in Florida for a week. It was cool, but sunny, and they filled the time walking the beach, shopping and yes, although they were the only hardy types out there, swimming in the Ocean. Brian never gets enough air time with his plane – either the weather or the work seem to be in the way, but he still logged enough air time to get some fantastic aerial photos, many of which were posted on our Resort Blog. 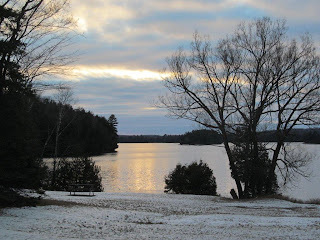 That Blog won a Muskoka Technology Achievement Award for Best Web Presence this year. The Blog has become a Journal of life at Bondi, for ourselves and our guests, and the readership is quite astonishing. It was not our only award, as it turns out, when Brian went to Gravenhurst to accept a Stewardship Award for Bondi from the Muskoka Steamship and Historical Society. In their words, Bondi has maintained the look and feel of the traditional family operated resort, and today is one of only a few that fall into that category. It’s nice to be recognized. The only upside we find to Social Media is that it helps us stay in closer touch with our friends, so please do join us on FB and follow our Blog. Nancy, recovered from her eye issues of last year, was happy to be back in the saddle, figuratively and literally. Her work on the Council of Lake of Bays, and as chair of the Heritage Committee are taxing, but there is good work coming out of it so it must be worth it! As usual, she is followed by a parade of animals – the horses all had a good year, with Abby winning the Provincial Championships. 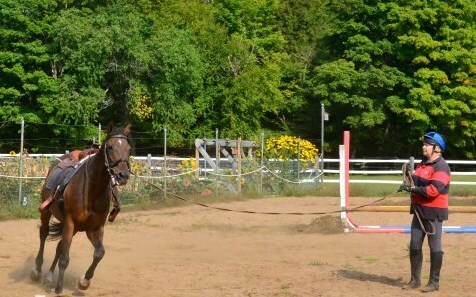 This lovely mare is for sale, ready to move to a new rider now, solid and experienced. Napster, our painting cat, reached more milestones in his career – with one of his paintings coming to rest in Rideau Hall. He is now sold worldwide. In the fall, he developed glaucoma and had to have one eye removed, resulting in a rather Piratical look, but he is doing well, and painting again. He is still fundraising to help off-set the formidable vet bills, if you are considering acquiring some of his art. Taffy, at two, is considering perhaps occasionally settling down, has her own fan club, and is a great joy and Nancy’s shadow. 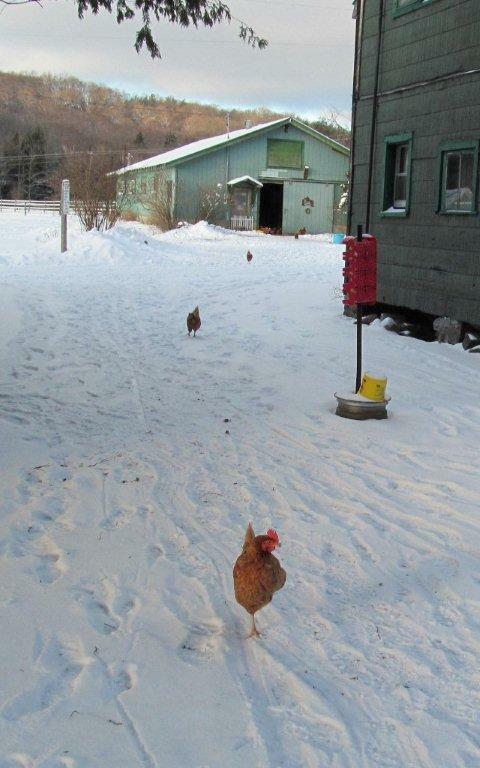 We had some wildlife encounters this spring with foxes in the hen house that caused much trauma, and resulted in the construction of a state-of-the-art chicken containment system. The deer continue to ornament the lawns, and eat the gardens if we are not vigilant. And the wolf pack was again on the property this summer for the Dark Skies and Wolf Howl programs we offer. The high point of that experience came when Nancy was up near our gravel pit with several guests hoping to have a ‘successful howl’ – and the big alpha male opened up in song less than 200 yards away in the dark. That was an experience our guests will never forget! This Spring, we had a plethora of newborn fawns on the property, including one tiny creature who’s mom had been killed, whom we rescued. Testing the theory that newborn fawns have no scent, when she was discovered, Taffy managed to stand directly on top of the fawn and keep right on walking, while the fawn never flinched. Such is the fawn’s faith in its world. It is a troubled world right now. Keep sight of the promise of Christ, for Whom the season is named. Be faithful in small things because it is in them that your strength lies. When you have come to the edge of all light that you know, and are about to drop into the darkness of the unknown, Faith is knowing that one of two things will happen: there will be something solid to stand on, or you will be taught to fly. Best wishes for the coming year from all the Tapleys at Bondi! This is a lovely week to look up at the sky at dusk. Talk about a "Star in the East" -- Jupiter, lovely bright big Jupiter, is sitting right next to the full moon. 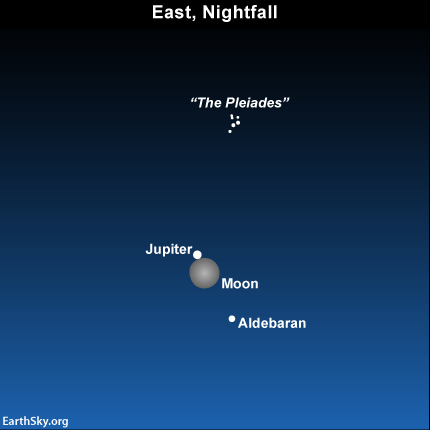 Aldebaran, the big eye of Taurus the bull, is just below, and easier to see a little bit later in the evening as the sky darkens and the moon lifts, but Jupiter -- well, there it is in its glory. Of course, the full moon will wash out much of the sky this week with its brilliance, but it can't dim Jupiter's shine. 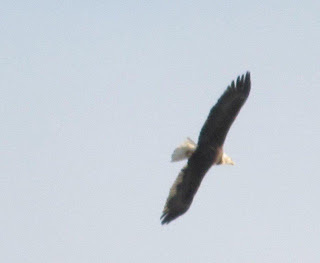 At 4.30 this afternoon, as I was standing by the stable chatting with Meredith on her horse, this fabulous -- and HUGE -- Bald Eagle slowly glided directly overhead. It is hard to photograph a bird in flight, when taken by surprise like that. I leapt nimbly through the snow in pursuit, (you would have been proud of me) but he curved west and cruised across the front of the Resort well out of my camera range. I don't care... I did get one shot. More importantly, I got the thrill of seeing this magnificent bird. They are still quite rare up here, so it's exciting. Pardon me if I seem to be jumping up and down still. I am. Labels: Bondi Village REsort. Bald Eagle. 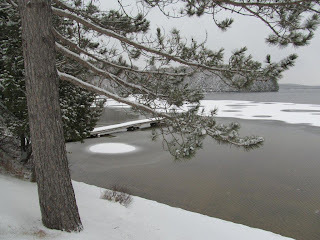 Algonquin Park. Muskoka. cottage rentals. Birdwatching. The logo says Yamaha, but that cannot be correct. 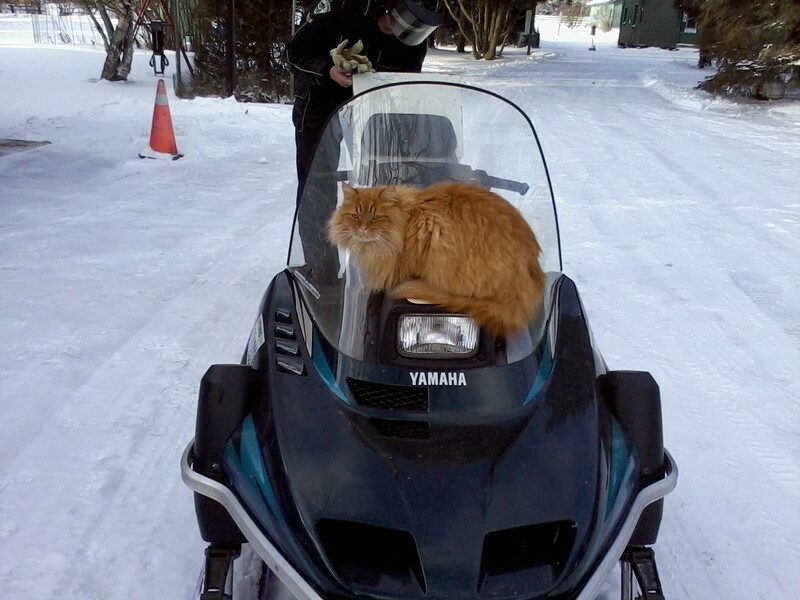 We'd swear it was an "Arctic Cat." Achmed knows where to sit to keep his paws warm and toasty. Today was the first day the BMD had the sleds out. They were able to pack in the Ski Trails -- not skiable yet, they need another fall of snow on top of the base, but close, oh so close. The toboggan hill is in decent shape, at least the bottom half. I've never had the nerve to go from the very top anyway, so I'm good with that. We welcomed our first guests of the Christmas season home to Bondi today, in a cold day drenched with sunshine, and with the resort looking like a Christmas card. We look Christmas Card Ready today. 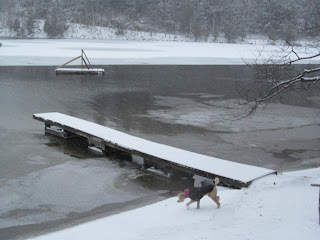 The snow came in with a big rush, and since the ground is now thoroughly frozen, it should stick around. Great news for our Christmas and New Years' guests who are looking forward to playing with the white stuff! 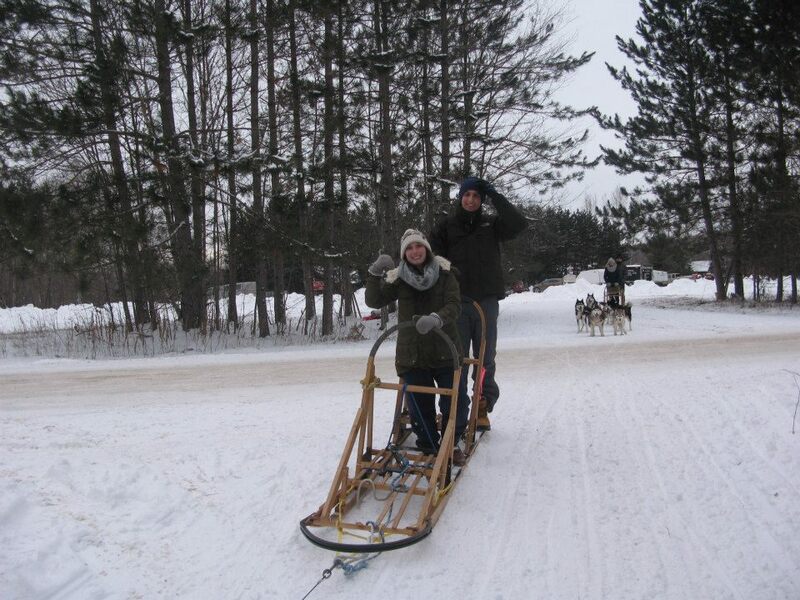 There are so many ways to enjoy winter. 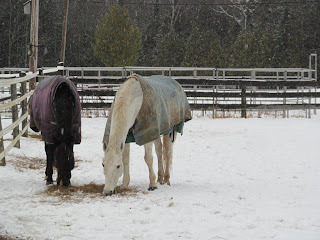 Some folk like to go out and try to catch snowflakes on their sleeves, mittens, tongues -- or noses. 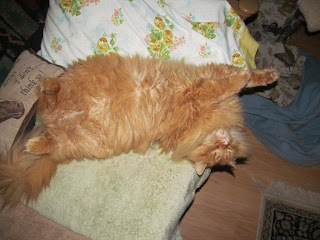 Taffy demonstrates the latter technique. Other folk prefer to spend a lot of time outside -- the best way to ensure you are going to enjoy an outdoor experience in winter is to be appropriately dressed, in several layers. Abby and Bailey demonstrate this for us, stylin' in their winter rugs. 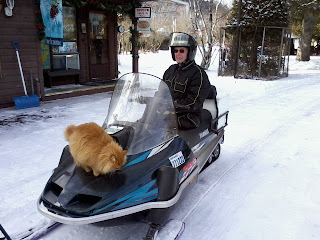 Skiing is popular -- we are hoping to have our ski trails open soon. Hidden Valley Highlands Ski Centre IS up and running, with almost every hill open and the terrain park very popular as well. Snowshoeing, and tobogganing -- they are all good to go. And for those who prefer to simply look at the fantastic view and like their winter to be on the other side of the window pane, while they are comfy by a blazing fire... Achmed demonstrates the correct technique for that as well. So winter is here, and Christmas is here, and the apocalypse is NOT here and all is good. 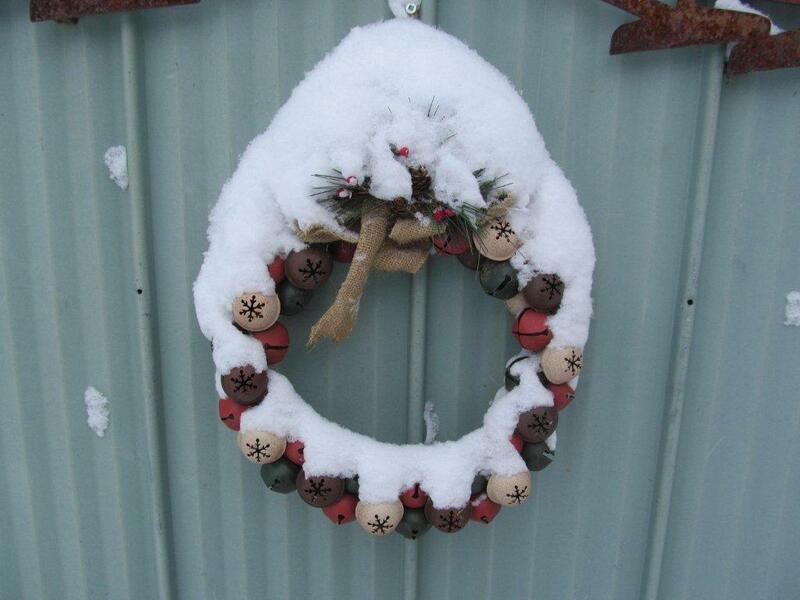 Merry Christmas everyone -- we are looking forward to our guests arrival, starting this very weekend, and we still do have some vacancies between Christmas and the New Year. Winter will be with us for a while -- if the Christmas season is too hectic, perhaps a relaxing weekend at Bondi Village later in the winter would be just the thing to let you unwind. Out walking with Taffy, we came face to face with Old Man Winter. Here he is, looking back at us from the ice along the shore by the cookout beach. He was playing some tricks. This photo has not been reversed. 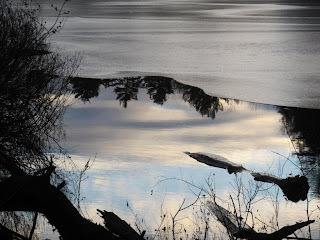 You are looking at the reflection of the hill and the sky beneath the edge of the ice. 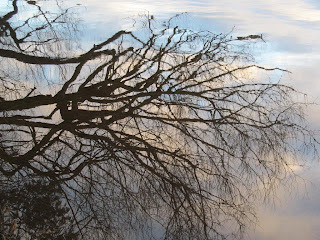 and this tree is just a reflection of the real thing, in very slightly rippled water. The Bondi Bunch will recognize this as the huge willow in front of my house. Taffy and I weren't the only ones enjoying a stroll along the shore. 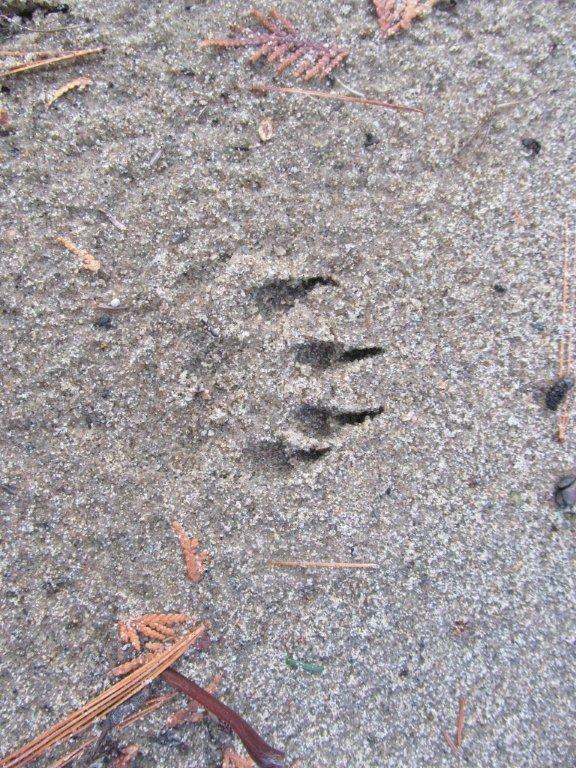 We found the tracks of both otter and raccoon. Not to mention deer. 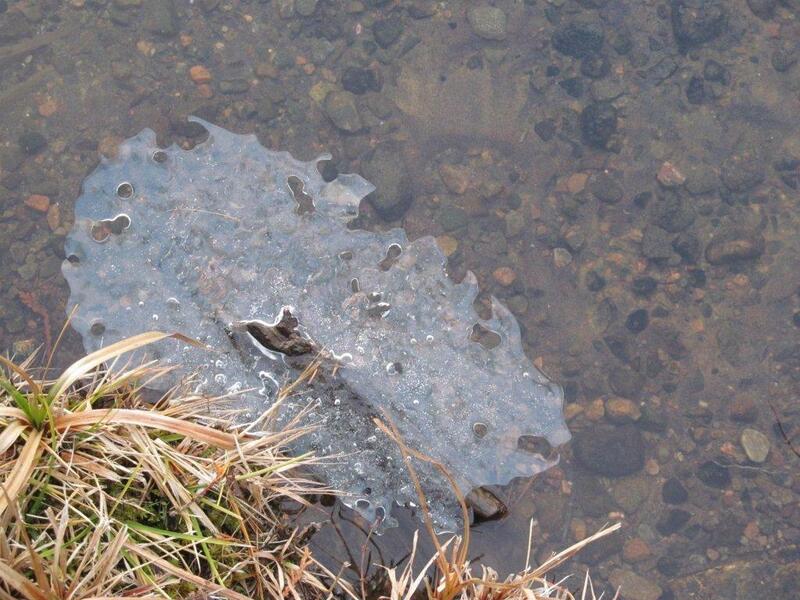 We also found this fragile ice shelf formed around a tiny stick, and doing its impersonation of a floating leaf. Finally, here's the sunset, just getting started, from near Farside and Longside cottages. I love the colours in the winter sky. Get Out. Stay Out. Look Up. Every August we head out onto the lawns at Bondi Village late at night to watch the famous Perseid meteor shower. The big plus to the Perseids is that the nights are usually pretty darn mild. 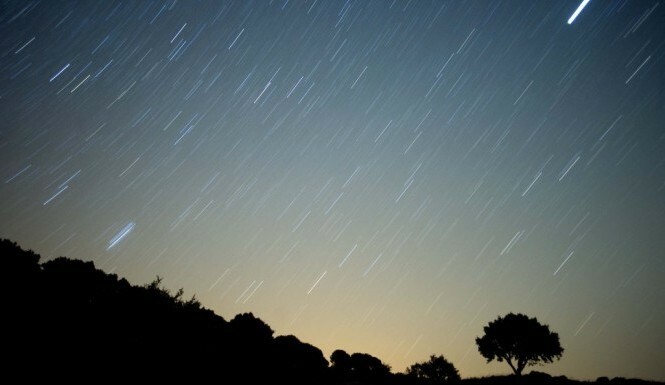 Some of the other meteor showers that put on yearly shows are not so considerate. The Perseid shower is produced by Earth running into the debris left behind by the Swift-Tuttle comet. 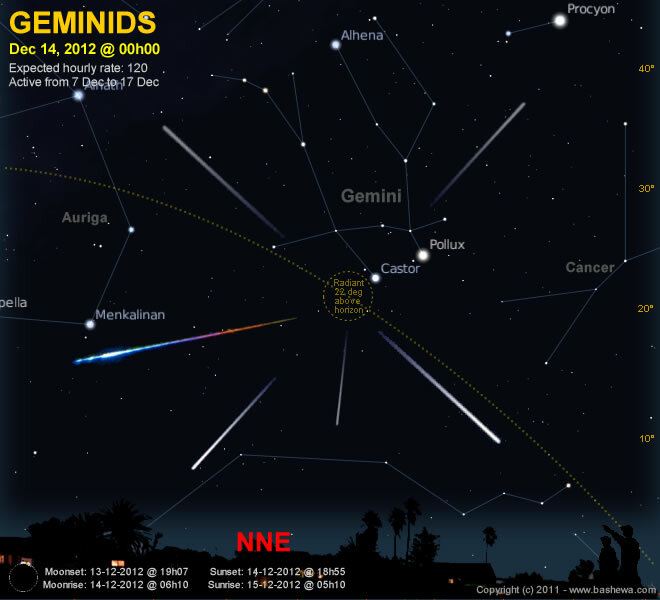 The Geminids are different -- the meteor shower here is caused by the deep sky object 3200 Phaethon -- thought to be a Palladian asteroid with a rock comet orbit, and one of only two meteor showers not originating from a comet. These are slower moving, and this year, pray for clear skies because with no moon it could be quite the show. The Geminids have been intensifying every year and recent showers have seen 120 to 160 meteors per hour in the 2 to 3 a.m. time frame. 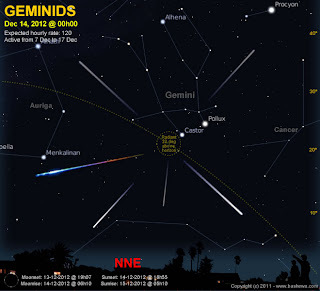 A bit of a modern phenom, the Geminids were first observed in 1862, much more recently than other showers such as the Perseids (36 AD) and Leonids (902 AD). An added bonus this year is the chance that you might also see Northern Lights. We've been seeing them through November, at low levels, but always more than welcome in our skies. So out you go. Take warm clothes and a mug of hot chocolate. After all, if we never look up, there will never be stars. Make a wish upon a Star -- what better time of year to do just that? Labels: Geminid meteor shower. Lake of Bays. Bondi Village Resort. 12/12/12. Now there is a date you don't see often. Or should we say, ever? Nor will we see the calendar line up like this again, so hopefully you have basked in the numbers today. Here, it snowed. 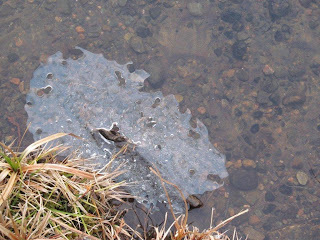 The bay is beginning to freeze over. Snow lying on top of the shelly new ice forms interesting patterns that change almost as you study them. 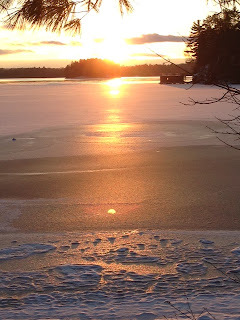 I was particulary taken with the perfect circle formed on the ice by the dock at Beaver cottage. 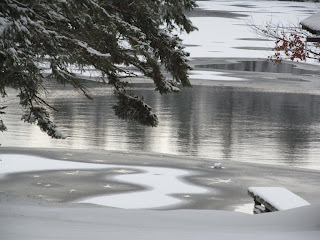 Someone called today, asking about the state of the ice-fishing... well, you could try fly-casting... trolling slowly... but sitting out there -- well, not just yet, folks! 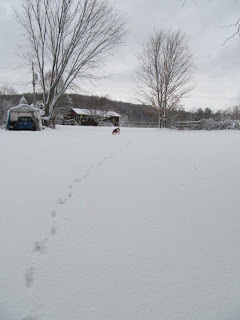 We are hopeful that we'll have a rink for the holidays. We're still on track for that! 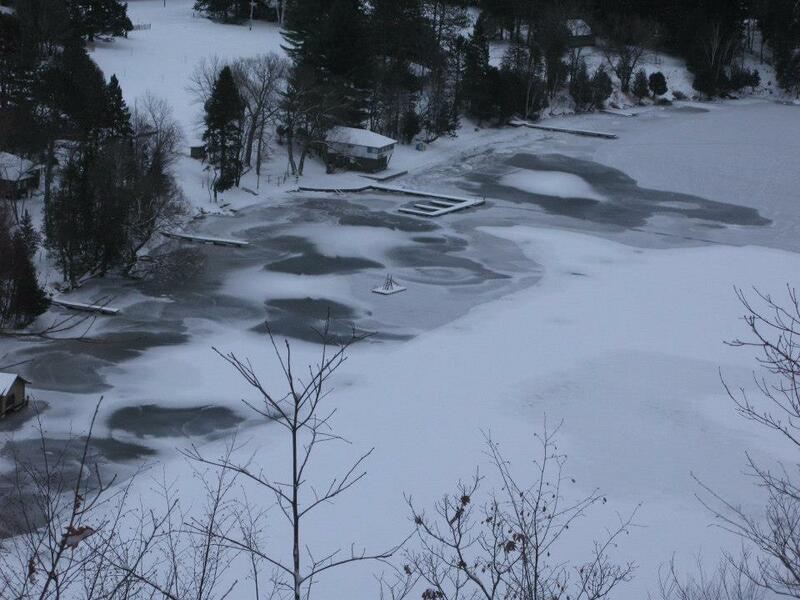 With our bay being shallow, it usually does freeze up long before the main Lake of Bays. 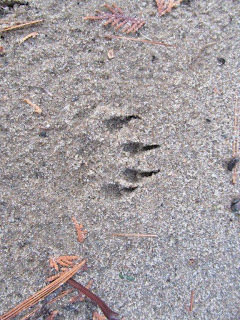 With the snow comes the chance to track animals -- both wild and more familiar. I was tracking Taffy back to the house, only to discover she was very enchanted with tracking the squirrel. 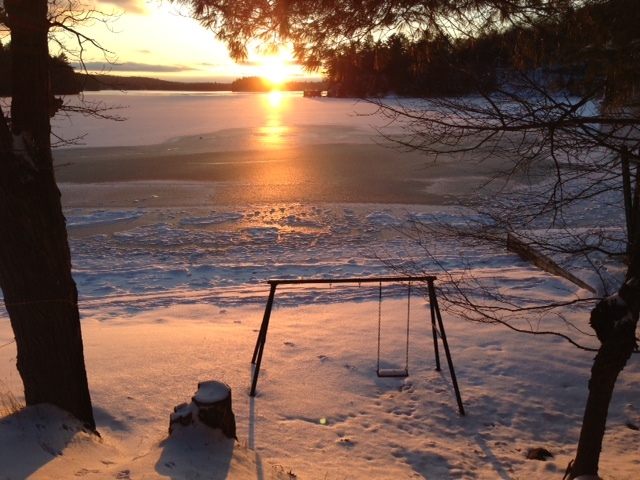 Ah, winter in Muskoka... something for everyone. Hanging About waiting for Holiday Ideas?